You’ve probably been working with Asana for a while and you feel like it’s about time to find a better alternative? Or you’re just browsing to see if there’s a software that can help you organize your overloaded task lists better. Well, let’s get it straight, there’s no perfect project management software. But if you’re looking for something more straightforward yet still powerful to meet most of your needs and keep your work well organized, you’ve come to the right place. Quire isn’t just an alternative solution to Asana, we’re so much more than that. We’re here to help you walk your dreams home, from gathering ideas, planning a project, executing tasks to tracking the progress then ultimately achieving your goals. With our approach, project management has never been easier and more streamlined. So no matter why you want to leave Asana and move on with Quire, just know that we got you covered. Your projects are in good hands now. 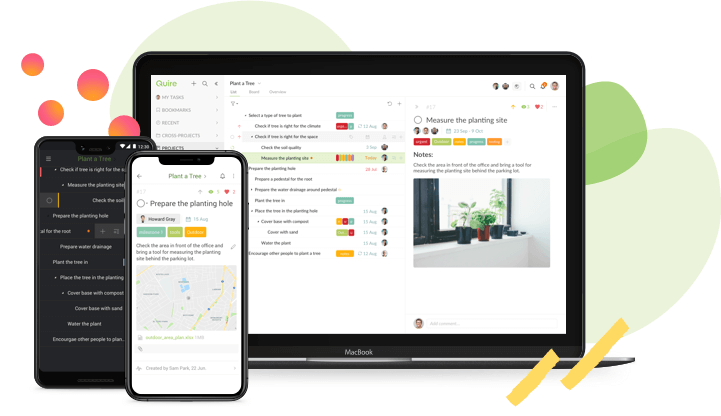 Why Quire is the best alternative to Asana? A simple and elegant user interface is the thing that Quire users appreciate the most. Our team spends years of effort to strive for a delicate balance between Quire’s simplicity and the powerful features. We’re here to simplify your workload, not to create a software that wastes your time on the learning process. Nested task list is our unique feature that you can break down big ideas into smaller and doable tasks. We have the unlimited tasks and subtasks options, which is perfect for achieving challenging goals in contrast to Asana’s flat to-do list. You can organize all of your tasks in a hierarchical list which maps your mind. Kanban board helps you visualize your work progress by selecting several crucial tasks that you need to focus on and move them to the boards. 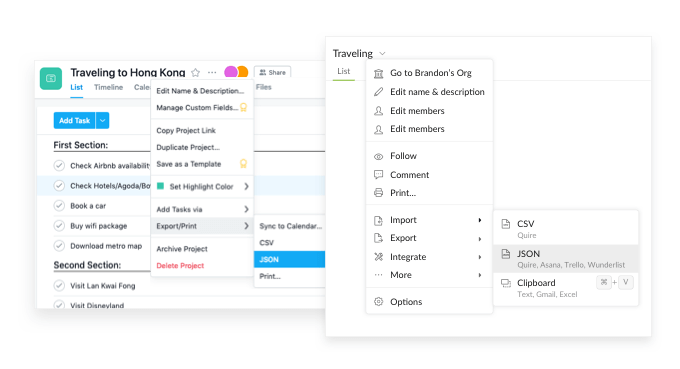 Unlike the way Asana forces users to pick either board or list view, Quire enables you to switch between two views anytime to get the big picture of your project. Streamline your workflow with the perfect combination between nested task list and Kanban board. A task list may easily grow into an overwhelming one as you’re working on the projects, that’s why we have the Kanban board feature. Quire task list with the hierarchical structure allows you to brainstorm and plan ahead for your projects. On the other hand, Quire Kanban board is for execution and progress tracking. Working with both views helps you focus on your daily, prioritized tasks in a visual representation of your workflow, and also get the entire perspective of your project at anytime. Permission control allows you to create external team to only work on the tasks that are assigned to them. External team cannot see or access other tasks in the same project. Also, Quire enables you to share links with your clients to view a private project or a task without them signing up for a Quire account. There are a lot more features that are waiting to be explored, such as: multiple assignees, Siri activation, Smart Folder, Zoom In, etc. So are you interested enough to have an account with Quire? Quire supports unlimited tasks and subtasks? This means you can have as many nested tasks as needed, breaking even the most daunting projects down to their actionable parts. Tasks can even be added by voice, using Siri. If you have been working with Asana for a while, changes can be uncomfortable, but you deserve the best! Here’s how you move your data from Asana to Quire: fast, simple and pain-free! Export your data from Asana into a JSON file (save as a JSON file from the web browser). Create a new project at Quire. Click on the dropdown next to your new project’s name. Import from your local JSON file. Now your projects from Asana should be already successfully transferred to Quire! You’ve been granted a new platform to successfully achieve your goal! Pick up where you left off with Asana. Enjoy your work with Quire! Try Quire today and let us know what you think!